Harold Ramis — director and co-writer of Groundhog Day and the brains behind the Ghostbusters operation, died today from complications related to auto-immune inflammatory vasculitis. He was 69. Chicago Tribune reports that the North Shore resident passed away at 12:53 a.m. from the rare disease he had been battling for over four years. We are all lesser without him. Well known and loved for his Ghostbusters character Dr. Egon Spengler, Ramis indelibly marked our childhood lobbing one liners between Bill Murray's antics. He was the brains of the operation, the guy with the gadgets, the character unafraid to "take the puppies away" or construct a highly volatile proton pack and strap it to the backs of his best friends. But in reality, the real Harold Ramis was even smarter than Egon. Simply put, Ramis' work behind the camera changed the scope of comedic film forever. Ramis' writing credits include Animal House and Ghostbusters. He directed Caddyshack, Multiplicity, and National Lampoon's Vacation. He wrote AND directed Bedazzled and the most re-watchable film in history: Groundhog Day. And that's just to list a few. Animal House wasn't just an excuse to feature John Belushi and friends. Ramis was searching for the long lost revolutionary spirit. In an interview with the New Yorker he explained, "Our generation's revolutionary energy had slipped away after Kent State and the rise of the violent fringe of the Weather Underground... We revived it." [Reitman] suggested that they ask Ramis to join the cast—and to do a rewrite with Aykroyd that would play to Murray's strengths. "Harold added the irony, the heart, the romance with Sigourney Weaver, and all the adult writing, as well as the structure," Aykroyd says. "And he knew which passes to throw Bill, so Bill would look funny throughout." 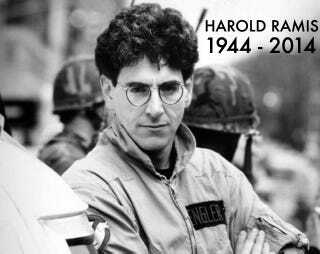 His influence escalated comedy from SCTV (Second City TV) to small cameos on Knocked Up, we will not forget you, Harold Ramis.